A chance conversation with Chris Puddephatt at Clashnessie on 22nd February resulted in one of the most interesting plant records from Assynt in recent years. He mentioned that on the 1st July 2015 he had been snorkelling with a friend off rocks on the western side of the Bay (NC058312), where he had been photographing a shoal of sand eels. 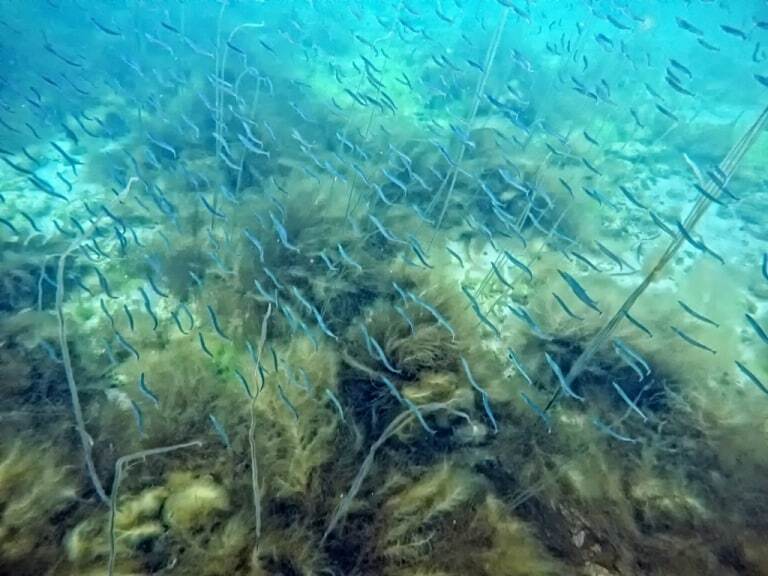 The shoal was swimming through a sparse bed of what appeared to be a green ‘seaweed’ with long parallel ‘fronds’, in water some three metres deep. This shows clearly in the photograph he took, from which I am able confidently to identify it as eelgrass Zostera marina, known previously from this area only as washed-up material (see my posting for 20th December 2014). Washed-up specimens of eelgrass have occurred on some six Assynt beaches, from Achmelvich to Culkein Stoer and Clashnessie, but it has only been reported growing in one place, Port Dhrombaig, by Trevor Lockie in 2001. It has long, flattened, shiny green leaves up to 1cm wide, growing from a rhizome rooted in mud, sand or fine gravel. It is an example of a very small group of marine flowering plants; two species are found around the British Isles, mostly on eastern coasts. Elsewhere in West Sutherland, washed-up material has only been seen, so far as I am aware, on both sides of the Faraid Head peninsula at Durness. The first record from Assynt was in 1955, at ‘Oldany’, but there are no further details and it has not been reported from there since. The shallow waters on the east side of the island would be a good place to look, but that will require underwater investigation; a challenge for the summer of 2016?